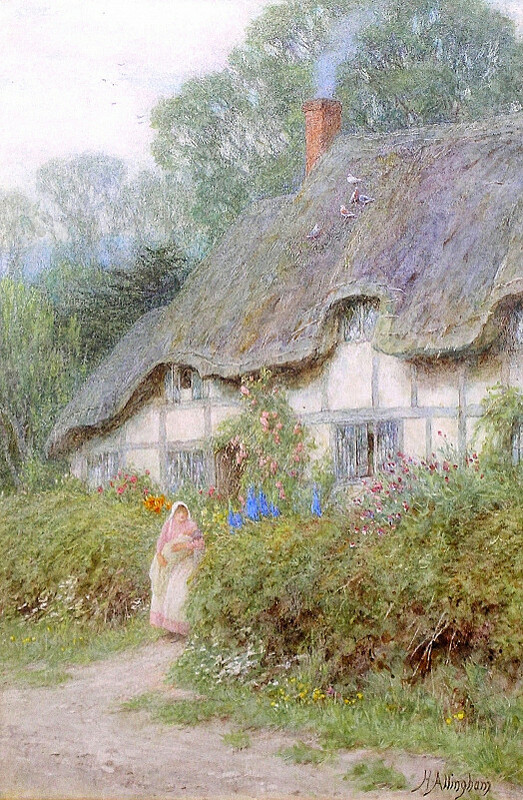 One of the most successful women artists of the Victorian age, Helen Allingham produced archetypal watercolour images of cottages and gardens. Helen Allingham was born Helen Paterson in Swadlincote, south Derbyshire, on 26 September 1848, the eldest of seven children of a doctor. She was brought up in Altrincham, Cheshire, where she attended the Unitarian school for girls, which had originally been set up by her maternal grandmother, Sarah Smith Herford. Then, on her father’s death in 1862, the family moved to Birmingham to live with her paternal grandmother. Helen Paterson studied at the Birmingham School of Design (1862-65), the Royal Female School of Art, Bloomsbury, London (1866-67), the Royal Academy Schools (1868-72) and the Slade School of Art (evening classes, 1872-74). In the spring of 1868, she visited Italy and, on her return to London, began to support herself by drawing illustrations for Once a Week and other periodicals. This led in 1870 to a permanent position as an artist on the staff of The Graphic. In that year she began to exhibit drawings at the Dudley Gallery. At this time, she was particularly influenced by the work of Fred Walker and Myles Birket Foster, who later became a friend. 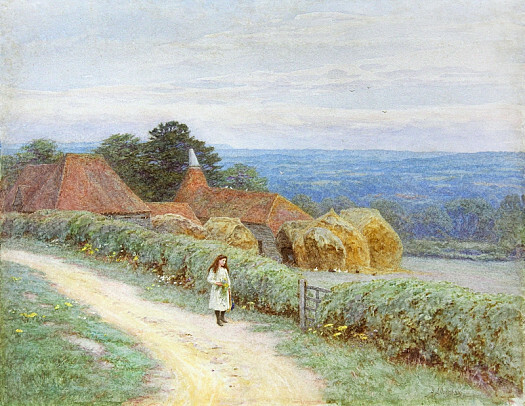 From 1881, Helen Allingham lived at Sandhills, near Witley, Surrey and specialised increasingly in scenes of rural life. These were exhibited in her first two solo shows at the Fine Art Society: ‘Surrey Cottages’ (1886) and ‘In the Country’ (1887). Following her return to London in 1888, she continued to make regular sketching expeditions into the countryside of Surrey and Middlesex, often accompanied by her close friend, Kate Greenaway. By the end of the 1890s, she was making efforts to expand the range of her subject matter; for instance, she produced a group of harvest scenes in the Kentish countryside near Westerham. 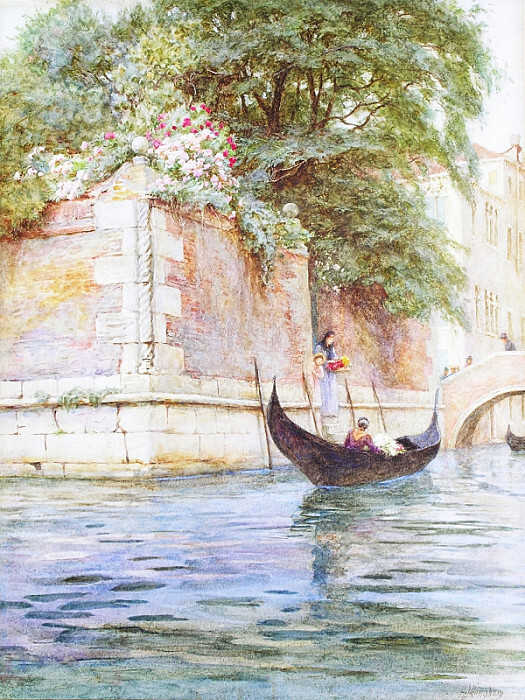 However, an exhibition of Venetian pictures at the Fine Art Society in 1904 was not a success. She died in Haslemere, Surrey, on 28 September 1926. Her work is represented in numerous public collections, including the British Museum, Burgh House & Hampstead Museum and the V&A.